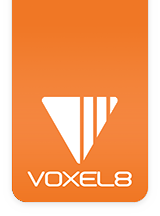 The Voxel8 team has created a custom slicer that allows for multi-material extrusion and has other features. Configurations in Euclid use the JSON format since the slicer lives in the cloud. These are top level options that are applied to the output or represent the configuration of the machine. This can be any string. For example if you slice with multiple configs, it is helpful to put the name in there like so: "_a_config.gcode"
because only the X and Z axis changed. This creates Gcode files roughly 40% smaller in common cases. Sets the internal working resolution in the XY axis for the printer. For example, setting this to 0.001 would use 1 micron as the lowest valid resolution while slicing. Any feature smaller than 1 micron will be discarded. Whether or not to export comments with the output. In Gcode these are lines prefixed with ";". Whether to export absolute E-values in Gcode. The default is false, which means relative E-values or deltas are used. The number of digits following the decimal place to export. e.g. 4 with a value of3.14159 would be truncated to 3.1416. An vector indicating where to center the part in the XY plane. For example [50, 60]would center the bounds around 50 in the x-axis and 60 in the y-axis. The offset of the skirt from the bounding box of the model. Set the build volume of the printer. Currently this is used to check if a print will be in the build area of the printer. A user-defined string to insert before the Euclid generated output. Newlines must be entered as \n. A user-defined string to insert after the Euclid generated output. Newlines must be entered as \n. The rate at which the printer will execute travel moves. The temperature of the heated bed. Set to 0 to disable. The command to send to halt move processing until user input. The command to send after activation. The command to insert after finishing the first layer with this tool. The command to send after finishing a layer with this tool. Reverses the print order of perimeters on alternating layers. This helps reduce error propagation. This has a substantial effect on quality with paste materials. The command to send after deactivating this tool. Adjust the slice height so that horizontal features are reproduced dimensionally correct. Determines if an E value will be attached when exporting commands for this tool. This is necessary for FFFTools, and helpful for visualizing the gcode of PneumaticTool. Commands to be executed when finishing an extrusion. Commands to be executed when starting an extrusion. Enable the fan if the time to print the layer is under the specified value. Override the first layer height to the following value. Set to a value <= 0 to disable. The nozzle temperature during the first layer. The number of insets to create on the first layer. The id of this tool. This corresponds to T<id> in Gcode. The density of infill on layers which are not solid. The rotation of the starting infill. Set in degrees. The rotation of the infill per layer. Set in degrees. Determines whether or not holes will be joined with perimeters. This prevents retractions and can improve the quality of holes. The maximum volumetric flow of this tool. The minimum print height of this tool. The minimum infill length to print. Anything smaller than this will be ignored. The minimum layer time for a layer printed with this tool. If a layer is less than this value, all moves will be scaled so the layer time is equal to this value. The maximum distance we can travel without retracting. Above this value, a retraction will be done. The maximum distance we can travel without turning off extrusion. Above this value, extrusion will be turned off by inserting the extrusion_postamble. If this value is 0 (the default), extrusion is always turned off before traveling. Array of strings indicating which paths are used, and the order they should be printed. Valid values are: perimeters, singlepaths, and infill. In terms of order, singlepaths are a type of perimeter, so they're printed along with perimeters. The number of perimeters to print around a section of the part. Choose to print more layers when dynamic_slice_height is enabled. The thickness of each layer. may change if dynamic_slice_height is enabled. The print rate config. See below. The amount to move upwards during a retraction. The length of material to reverse during a material retraction. The distance to move into the part prior to retraction. This can prevent blobs in printed sections. Whether or not to send an offset command for this tool. Weather or not to print a skirt. A skirt is a single path traced around the part. This is useful for ensuring the extruder is primed before starting a print. The number of solid layers to print. Whether or not to wait for the tool to reach target temperature before printing. These options are specific to FFFTool. The filament diameter used as feedstock. These options are specific to PneumaticTool. The maximum area at which we could consider a point for point deposition. The rate of flow during a point deposition. The command to execute following a point deposition.